At the age of 29, a profound inner transformation radically changed the course of his life. He realised that an essential aspect of the awakening process consists in transcending our ego-based state of consciousness – a prerequisite not only for personal happiness but also for the ending of violence on our planet. New York Times writer called Tolle “the most popular spiritual author.” In 2011, critics put him at number 1 in a list of “The 100 Most Spiritually Influential Living People”. 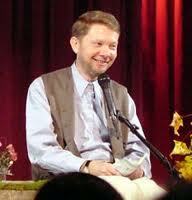 Eckhart is a sought-after public speaker and teaches and travels extensively throughout the world. Ulrich Leonard Tolle was born in Lünen, Germany on the 16th of February, 1948. From birth through age 13, Eckhart Tolle lived an unhappy and disturbing childhood in his native Germany. There, his parents fought and eventually separated, and he felt alienated from a hostile school and home environment. While playing in buildings destroyed by Allied bombs during World War Two, Tolle felt depressed by his experience of “pain in the energy field of the country”. At the age of 13, he moved to Spain until the age of 19 to live with his father. Tolle’s father did not insist that his son attend high school, and so Tolle elected to study literature, astronomy and language at home. At the age of 19, Tolle moved to England and for three years taught German and Spanish at a London language school for businessmen. Troubled by “depression, anxiety and fear”, he began “searching for answers” in his life. At age 22 or so he decided to pursue this search by studying philosophy, psychology, and literature, and enrolled in the University of London. After graduating, he was offered a scholarship to do research at Cambridge University as a postgraduate student and was admitted there in 1977. Tolle was depressed for much of his life until he underwent, at age 29, an “inner transformation”, then spent several years wandering and unemployed “in a state of deep bliss” before becoming a spiritual teacher. He stayed with friends, in a Buddhist monastery, or otherwise slept rough on Hampstead Heath. His family thought him “irresponsible, even insane.” Tolle changed his first name from Ulrich to Eckhart, by some reports in homage to the German philosopher and mystic, Meister Eckhart. After this period, former Cambridge students and people he had met by chance began to ask Tolle about his beliefs. He began working as a counselor and spiritual teacher. Students continued to come to him over the next five years. He relocated to Glastonbury, three hours west of London, a major centre of alternative living. In 1995 at the age of 47, after having visited the West Coast of North America several times, he settled in Vancouver, British Columbia, where he met his wife to be, Kim Eng. Tolle’s first book, “The Power of Now”, was first published in 1997. Only 3,000 copies were published of the first edition. Tolle recalls : “I would personally deliver a few copies every week to some small bookstores in Vancouver …friends helped by placing copies of the book in spiritual bookstores farther afield”. In 2000, Oprah Winfrey recommended it in her magazine and soon after it reached the New York Times Best Seller list. By 2008, the book had been translated from English into 33 languages. Tolle is not identified with any particular religion, but he has been influenced by a wide range of spiritual works. In 2005, Tolle published his third book, “A New Earth”, which assumed the number one position on the New York Times Best Seller list several times between March and September 2008. By the end of 2008, it reached the list for the 46th time. The high sales of “A New Earth” in that year followed its selection by Oprah Winfrey for her book club in January. In the four weeks following the announcement, 3.5 million copies of the book were shipped. Tolle partnered with her to produce a series of webinar sessions beginning in May 2008. The weekly webinar sessions included discussions between Tolle and Winfrey, silent meditations, and questions from viewers via Skype. Each webinar focused on a specific chapter of “A New Earth”. The third webinar attracted more than 11 million viewers. Tolle gives speeches and workshops in English and occasionally in German or Spanish. He also travels for various speaking engagements, such as seminars and retreats. Tolle has indicated that he had no intention of creating “a heavy commercial structure”, nor of setting up an ashram or centre. He believes one “could develop organically” and said “one needs to be careful that the organization doesn’t become self-serving”. Tolle writes that religions “have become so overlaid with extraneous matter that their spiritual substance has become almost completely obscured”, that they have become “to a large extent …divisive rather than unifying forces” and become “themselves part of the insanity”. Tolle writes that “the most significant thing that can happen to a human being [is] the separation process of thinking and awareness” and that awareness is “the space in which thoughts exist”. Tolle says that “the primary cause of unhappiness is never the situation but your thoughts about it”. At the core of Tolle’s teachings lies the transformation of consciousness, a spiritual awakening that he sees as the next step in human evolution. An essential aspect of this awakening consists in transcending our ego-based state of consciousness. This is a prerequisite not only for personal happiness but also for the ending of violent conflict endemic on our planet. In his book “A New Earth”, Tolle describes a major aspect of the human dysfunction as “ego” or an “illusory sense of self” based on unconscious identification with one’s memories and thoughts, and another major aspect he calls “pain-body” or “an accumulation of old emotional pain”. He notes that “one of the key elements is that deep within the mind is absolute stillness in which one can experience ‘the joy of Being'”. He is teaching process, not doctrine or dogma. He is teaching how to see and be present, not what one should see when one is present. Through his writing and seminars, his simple yet profound teachings have already helped countless people throughout the world find inner peace and greater fulfillment in their lives.